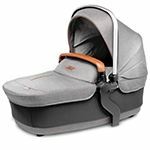 A very special fusion of luxury and innovation, the Silver Cross Wave is designed to give your newborn the very best comfort and protection. It is future-proofed for growing families – all in one clever package. 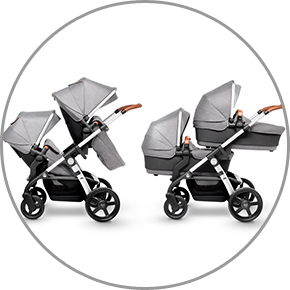 The innovative One plus One® system transforms the Wave from a single system to a double without the need for an extra purchase, as there is both a carrycot and a seat unit included straight out of the box. 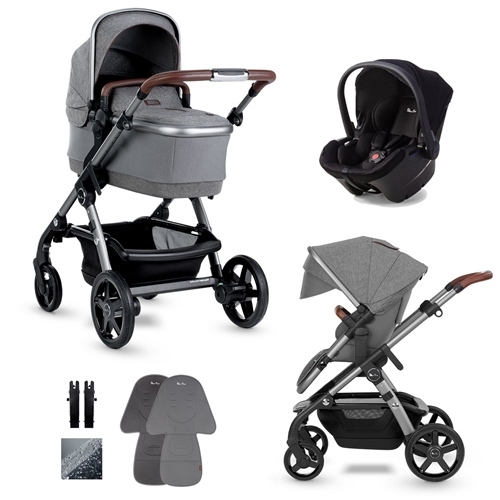 Wave boasts a wealth of features for baby comfort, like the ventilated carrycot that is suitable for overnight sleeping and the hood and aprons for both the carrycot and pushchair to ensure baby is always protected. A fully extending hood with pop out visor and UPF50+ provides sun protection, with two mosquito nets and two raincovers to ensure baby is shielded whatever the weather. Mums have been road-testing convertible pushchairs for Mother & Baby magazine’s Big Test – and judged Wave the winner! 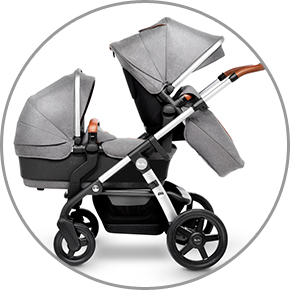 Here’s the Mother & Baby verdict: “This is so stylish and easy to use. It’s a dream to assemble, converting it from a single to a tandem is a doddle and there are lots of seat configurations." 1 x Seat liner, coordinating padded liner. 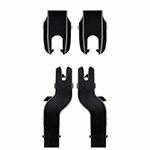 2 x Adaptors - Included are a pair of Simplicity car seat adaptors and a pair of tandem seat adaptors so you can use the One Plus One® function straight away. 1 x Silver Cross Simplicity infant car seat (Black) - Fit the included car seat to your Wave using the supplied car seat adaptors to create a full travel system. SILVER CHASSIS - Built to last, Wave has an aluminium and magnesium alloy chassis for strength and a four-way independent wheel chassis with puncture proof tyres. 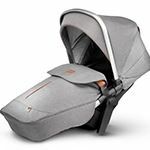 CARRY COT - Ventilated carrycot suitable for overnight sleeping and two aprons for both the carrycot and pushchair to ensure baby is always protected. CARRY COT HOOD & APRON - A fully extending hood with pop out visor and UPF50+ provides sun protection in a stunning claret colour. SEAT UNIT HOOD & APRON - Additional seat unit hood & apron pack with soft jersey lining for added warmth and comfort, weather proof hardy outer material. COORDINATING SEAT LINER - Sumptuous jersey padded seat liner for extra comfort included. 2 RAIN COVERS - 2 fitted rain cover fits snugly over both the Wave carry cot and seat unit to provide protection from the elements. 2 MOSQUITO NETS - Included are 2 mosquito nets for both the carry cot and seat unit. Both will fit snuggly over your Wave to protect your little ones from bugs. CUP HOLDER - The cup holder can be fitted to either the left or the right side of your Wayfarer and is suitable for all sorts of beverage containers. 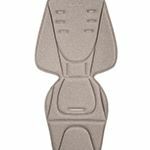 2 ADAPTORS - Included are a pair of Simplicity car seat adaptors and a pair of tandem seat adaptors so you can use the One Plus One® function straight away. Included in the Wave is the carrycot & seat unit that can be used to convert the Wave into a double pram. If you are planning to grow your family, the Wave will grow with you. 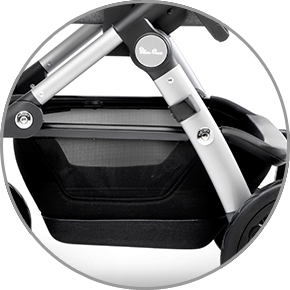 With an additional carrycot or seat unit you can create multiple configurations. 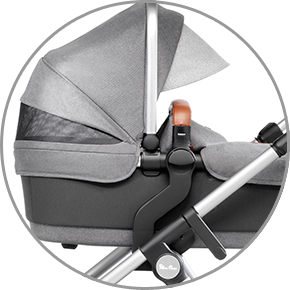 Wave’s attention to detail really sets it apart; from the hard shell shopping basket to protect your essentials, to the silent hood to keep baby snoozing peacefully. The included coordinating fabrics and trims make this one of our most luxurious products. 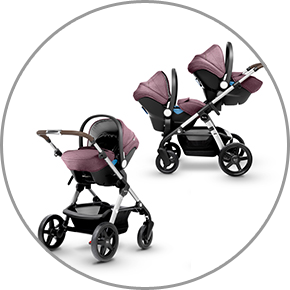 You can also create a convenient twin travel system using the Wave chassis when you add the Simplicity car seat(s). Retractable hood, Cosytoes apron, Newborn comfort wedge & Baby head support. We purchased this travel system for our Baby who isn't due until June. The item arrived within 5 days of ordering very well packaged. My husband put it together which was very easy to do. We have pushed it around the house to try it out and so far I would say the pram feels great to push very light yet sturdy. The adjustable handle is great for extending to a height that suits both my husband and I.
Samuel Johnson are a great company. I would definitely recommend them.